On March 31, two of our National Student Mutt-i-grees Ambassadors sat down to discuss their experience in the program. With the help of a canine veteran of the Curriculum, the students connected the dots between humans and animals. 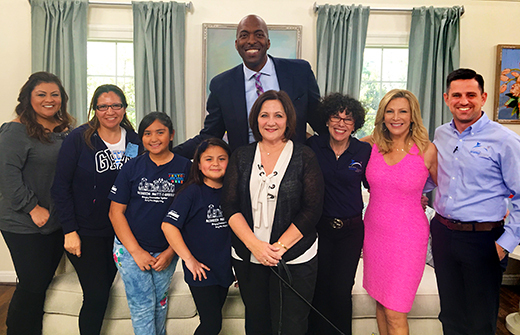 Two National Student Mutt-i-grees® Ambassadors in California — Julissa Ortez, 10, from the Fenton STEM Academy, and Myleen Acevedo, 7, from the Fenton Charter Leadership Academy, both in Sun Valley, Calif. — took center stage as special guests on Hallmark Channel’s Home & Family show, hosted by Kym Douglas and John Salley. The dog-star of the national broadcast was Jeter, the inaugural member of our canine classroom corps. Jeter was adopted in 2010 from North Shore Animal League America by Toni Frear, guidance counselor at the Fenton schools, which was one of the Curriculum’s pilot sites. Today, Jeter has matured, and is a co-counselor and canine reading specialist who works with Toni to help students express themselves and gain self-esteem, empathy, and pride in their accomplishments. Jayne Vitale, Director of Outreach and Youth Development Programs at North Shore, also joined the cast to explain Curriculum’s mission and the positive impact It has on kids, pets, and the community. But it was Julissa and Myleen who stole the show. Their confident testimonials about the Curriculum and Jeter demonstrated sensitivity, self-awareness, and compassion. What better endorsement could the Curriculum possibly ask for than two young, enthusiastic students who were growing daily with Jeter and the Mutt-i-grees? Click here for the Mutt-i-grees® segment on Home & Family. Front row, left to right: Natalie Acevedo (Myleen’s mother); Maria Estrada (Julissa’s mother); Julissa Ortez, Myleen Acevedo, National Mutt-i-grees® Student Ambassadors in the Fenton schools; Toni Frear, guidance counselor at the Fenton schools; Jayne Vitale, Director of Outreach and Youth Development Programs, North Shore Animal League America; Kym Douglas, Hallmark Channel’s Home & Family; and Matthew Carroll, Offsite Manager, North Shore Animal League America. In back, John Salley, Hallmark Channel’s Home & Family.